Chad Lenz has been a guide since the early 1990's, a career that came not only as second nature to him, but a natural progression, as he had always taken friends and family on hunting and travel adventures. 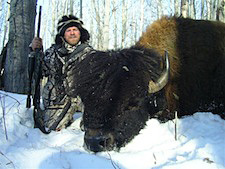 Today Chad is a professional hunter; his passion is guiding, outfitting and hunting for all species around the world. 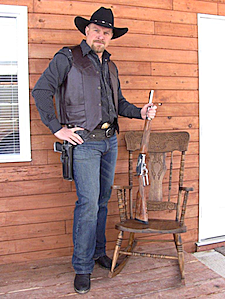 Chad grew up near the Alberta Rockies spending most of his time living the western lifestyle near horses and cattle ranches in the west. 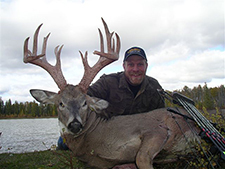 He has been an avid outdoorsman, hunter and guide for most of his life. He has always been very successful in the woods, honing his tracking and outdoor skills to new levels, and as such, his early hunting buddies gave him the nickname "SAVAGE". Chad has been addicted to the wilds since elementary school, taking big game animals with archery equipment and rifles in his early teens. Chad is "Living the Dream" and has had the privilege to explore some of western Canada's great wilderness as well as some worldly exotic locations in his life's quest. Experience and skill has been developed over the years to add to Chad's natural ability to find what's he looking for no matter the terrain or obstacles that may hamper the quest. Chad SAVAGE Lenz has spent countless hours and days in Alberta's West Country, Northern British Columbia, Yukon, and North West Territory discovering for himself and his clients what these remote locations have to offer. Chad has also been fortunate to be able to chase his passions in the Arizona desert, Texas, Idaho and many other states, as well as Old Mexico. Off the North American Continent Chad has traveled to Africa, Australia, and Asia and he has plans to see the rest of the world! There are those that live the dream and those who just dream, life is too short to say "I wish I would have..."
Enjoy our websites, share our adventures and join us!